This interesting batch of rian chanted by Lp Koon comes with an story with King Rama 9 visiting Luang Phor Koon. There was once King Rama 9 and his son each took an helicopter to Wat Ban Rai and King Rama 9 asked his son do you want to pay your respect to Lp Koon and he reject, hence King Rama 9 went in alone to pay his respect. After paying his respect and decided to leave, his son helicopter could not start for no obvious reason, hence King Rama 9 told his son to go in to pay his respect to Lp Koon which he did and his helicopter is able to start again. After which this batch of amulets with an helicopter image at the back was created. 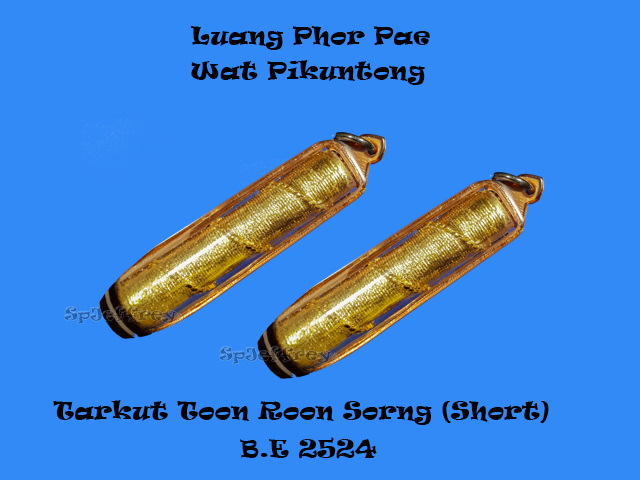 Amulets chanted by Luang Phor Koon holds great wealth and protection which many have experience his miracle and Lp Koon once said that those who have me will not be poor, if you pray sincerely to him and work hard, Lp Koon will look after you well. Kindly do your homework before renting anything as no refund will be entertained.Unless its a proven fake piece, FULL REFUND WILL BE GIVEN BACK. Happiness does not depend on what you have or who you are, it solely depends on what you think. 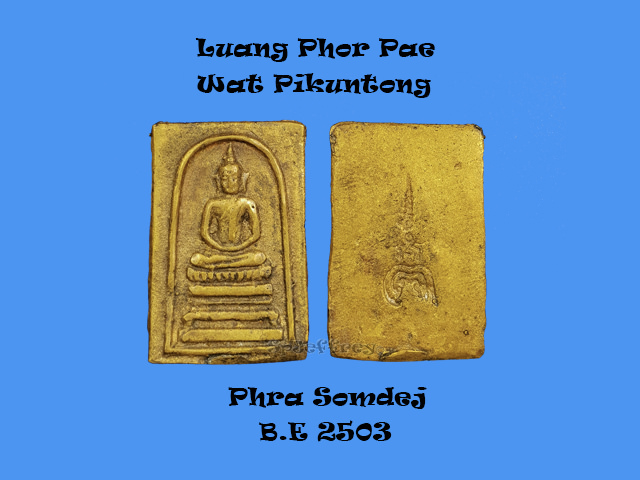 A rare piece of Phra Somdej B.E 2503 as it is using the traditional pour mould method to make this beautiful Somdej out and B.E 2503 features a smaller yant at the back of the piece which makes it more special. It hard to find in the market as lesser pieces have been made. 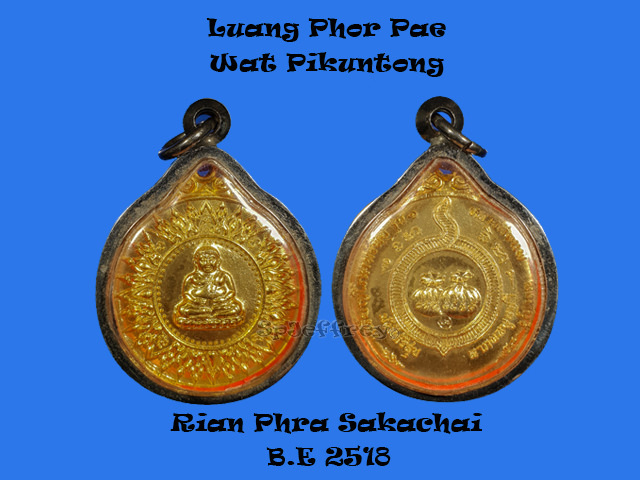 A piece Luang Phor Pae collector should not miss and Phra Somdej made by Lp Pae is well known for smooth sailing, metta and wealth. Lp Pae is famous for his pollen powder which is used for making amulets and many experience great metta with it. 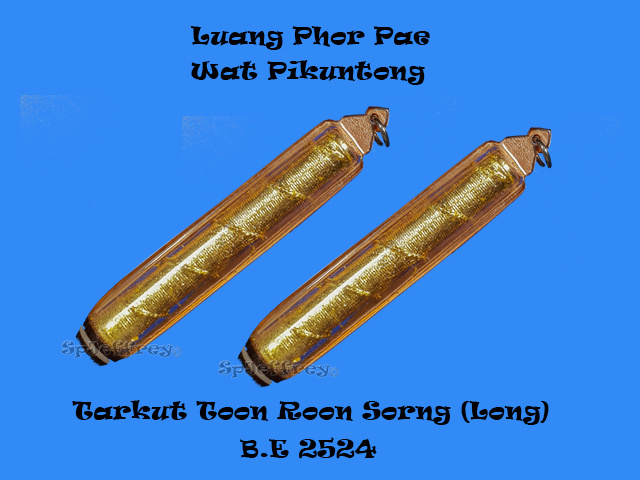 Hence Lp Pae decided to make a batch of Phra Khun Pean in B.E 2522 and its was so good with metta and maha senah that people start to misused it, once Luang Phor heard of people mis using it, he have decided not to make anymore batch of Khun Pean. A great piece with mint condition suitable for collecting or daily wearing. Two version of this tarkut was created and one is short and another is a longer version. Both have been pitong and been encased with original temple plastic case. Tarkut chanted by Lp Pae have been known to have great wealth and metta which some experience coming out unharmed from accident. Tarkut are getting rare now a days in the market as it is easily kept in bag or pocket with no restriction on wearing it on upper body. Last edited by spjeffrey; 25-08-2018 at 12:54. 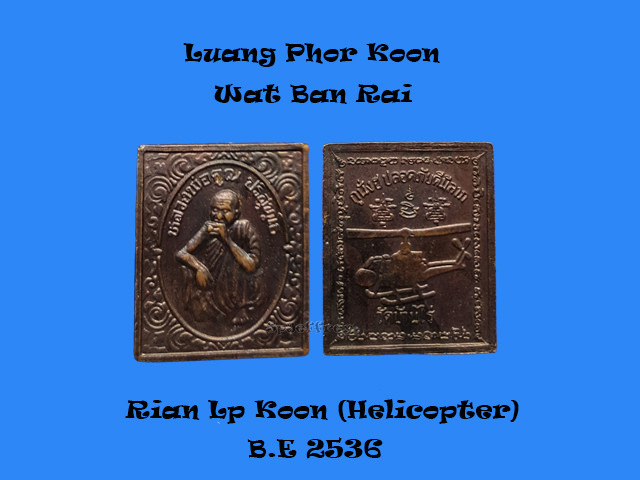 A very beautiful and mint condition of rian Sakachai chanted by Lp Pae in the early years. The back of the rian featuring two money bag in the middle meaning having infinity wealth. A great piece for wealth and metta suitable for believers doing business or in the sales line. A condition so mint and well kept that nur geilaitong is still shiny and have not gone dull yet, view it with your own eyes! Using traditional pour mould method to make this beautiful piece of amulet personally chanted by Lp Pae. Lp Pae is well known is granting wishes, metta and wealth if you pray sincerely. A great piece to wear daily or place it at your work place to pray to it daily. 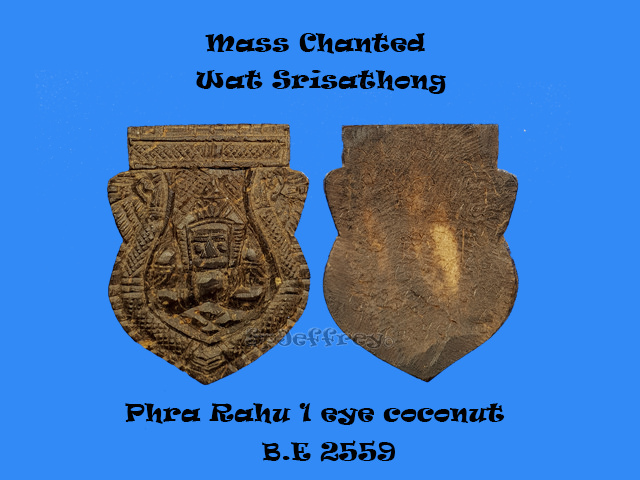 Wat Srisathong is the best temple to product the best Rahu amulet throughout the whole Thailand and using 1 eye coconut shell to crave the amulet out is the most effective material effect as it is not easy to find an 1 eye coconut as so very limited pieces is made each time. 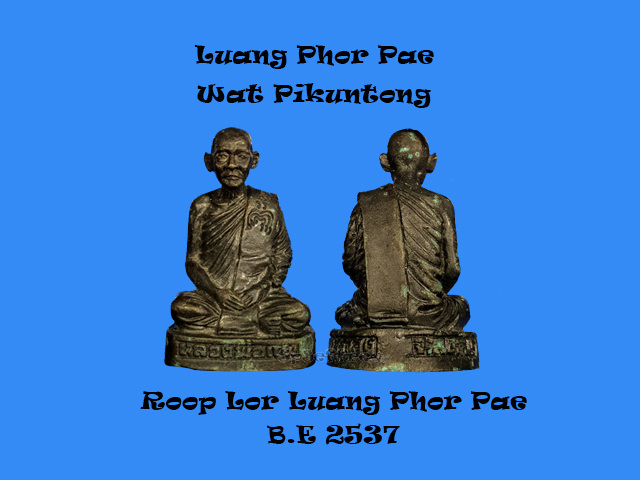 Blessed by Lp Kawau and top monks is the year of B.E 2559 and featuring hand carved yant and following Lp Noi traditional of making his famous Rahu. Phra Rahu is know to help changing one person luck by chagrining the bad ones into good ones. Getting rid of bad stabbers, gossip around and protection away from evil spirit. Ingredients chanted in Wat Suthat for 9 months, added with many holy powder and herbs in it before Lp Tim bring it back to created with batch of amulets with a very good name given to it. 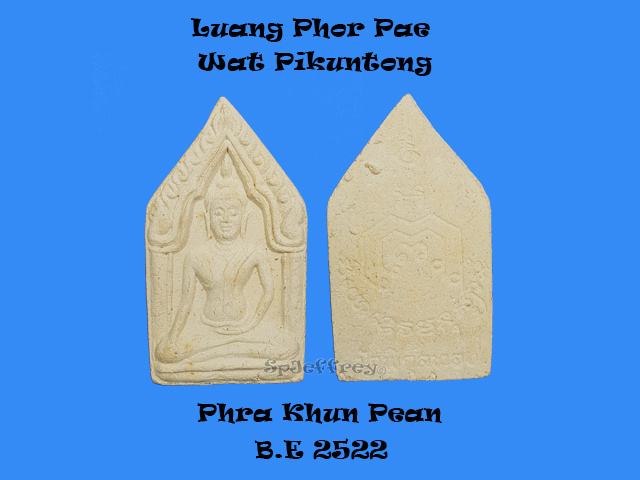 Phra Phichit its a Buddha that helps in smooth sailing of life, removing obstacle and bring luck to the wealth. 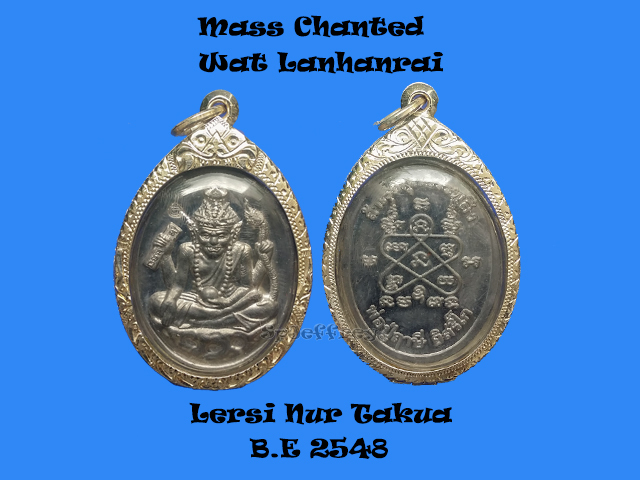 Moreover amulets chanted by Lp Tim holds great wealth and metta making it one of the all rounder amulet around. A small piece great for wearing without feeling a weight on your neck or even for ladies or kids as it is small in size. 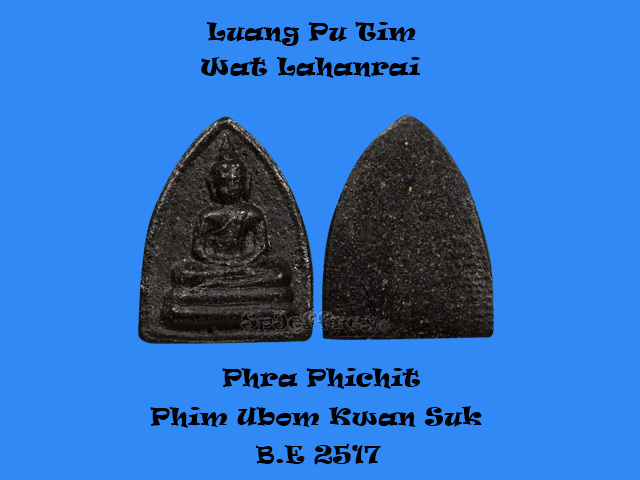 A piece of beautifully made Phra Lersi amulet chanted in Wat Lanhanrai by disciple of Luang Pu Tim, such as Luang Phor Sakorn, Luang Phor Sin, Luang Phor Foo, Ajarn Chinaporn. As lead is the most basic martial that is the easiest to absorb chanting, it is considered one of the best material around to make amulet. Phra Lesi is known to bring good fortune and luck to believer, granting wishes, ward off evil spirits and removing obstacles. As this piece is very well protected that the lead material have not darken over time hence a piece excellent for collection too. All times are GMT +8. The time now is 20:21.